Alphabet City’s relative isolation fosters a unique quirkiness and sense of community, and Casimir fits the surrounding landscape perfectly. I got a chance to check out their $19.99 bottomless mimosa/bloody-mary brunch over the weekend. Now, if you’re like me, you’ve always associated French cuisine with snobbishness (which may be related to the fact that you never bothered to learn how to pronounce anything in French), but this restaurant has figured out a way to blend Francophilic food with a relaxing, laid back atmosphere. A walk through the medium-sized dining room accented by weathered chairs and tables will bring you to a sunny back patio where you can enjoy the shade of an umbrella or sit in the sun. A friend and I chose patio table in the sun. In addition to (several) mimosas, my friend chose a dish featuring baked eggs and feta with potatoes on the side while I went with a bagel with salmon, tomato, onions and capers. We both opted for a side of bacon from the a-la-carte menu. My friend had nothing but good things to say about his dish, and the potatoes I poached from him (he’s a carbophobe) were perfect! I had my doubts as to whether a salmon bagel would satiate, but my selection was perfectly portioned and delicious! Oh, and the bacon: excellent. Our waitress convinced us to try dessert, which isn’t an easy feat when you’re serving French to a lactose-intolerant consumer (which I happen to be). My friend got pistachio ice cream with a shot of espresso on the side, which he loved. 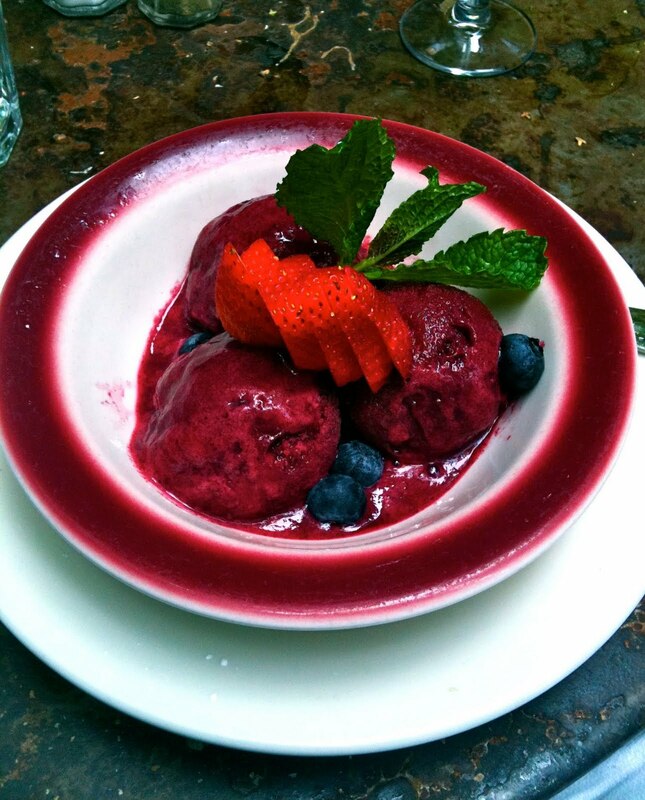 And my black currant sorbet with fresh blueberries and strawberry slices was a silky-smooth pallet cleanser. If you get a chance, definitely check out this brunch. The prix-fixe menu along with the a-la-carte menu has a bit of something for just about everyone. The staff is laid-back yet helpful, and a good portion of the customers around us seemed to be regulars (always a good sign). Plus, there was no wait for our table! The combination of the relaxing atmosphere, the service and the quality of the food makes this $19.99 bottomless brunch one of the best deals in the city! It would really help to note in your review what types of drinks come with the brunch. This is an essential factor for any bottomless brunch!